I made a conscious decision last year to make 2009 all about me. I know it sounds selfish, but I feel it was the best choice I could have made at the time. And honestly look at where I am today? Had I not worked towards what I really wanted for myself, I am quite positive I would not be typing this and looking out the window at the Eiffel Tower all in the same instant. But, nice as it is, to be in the little world of “me, myself, and I”, it’s time to shake things up a bit. Bring in some balance. 2010, for me, is all about giving back. This last month, I participated in a portrait project called, Help Portrait. Best to have a look at the site, but in a nutshell, it was inspired by a photographer named Jeremy Cowart, who felt that the world needed to smile more. For one day, photographers from all over the world organized an event and shot portraits for people in need (of a smile, of some inspiration, of a new beginning…) asking for nothing in return (in fact, we were instructed to delete the images from our hard drives once the images were printed and given to the subjects). I participated in the Paris community, and had such a wonderful time. In a world so full of complications, it was nice to be reminded of the genuine human spirit. It was something I knew I had to keep pursuing. So, I begin this year with an idea, a project of sorts (the first of many, I hope). I’ve never done this to such a capacity before, but I think it is about time that I have an art print sale. I’m calling it “My Dream in Prints” – and all of the images available for purchase are from these last few months (aside from one, which I decided to include because it helped me get to Paris). I can’t believe I’ve managed to come up with a whole catalog! With each purchase, 25% of art print and postcard sales and 30% of canvas sales will go straight into the hands of the Make a Wish Foundation. There are PLENTY of charities that I have my interest in working with, everywhere from the topic of breast cancer, humane societies, to art enriching programs (all of which will likely get my attention at some point this year and beyond). But Make a Wish struck a chord in me when it comes to what I am doing here. Without getting too sappy like some previous posts…(you probably already ‘get’ the story) it is a foundation that exists to make dreams come true. Everyone deserves the experience that I have had – no matter what their dream is. So, I am using the outcome of my dream to hopefully help fulfill someone else’s dream. Simple as that. Here is a link to the catalog gallery. 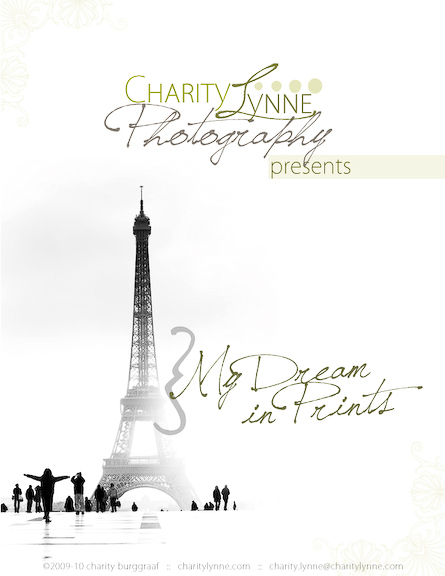 The images can also be seen in ‘full’ scale at www.charitylynne.com, select ‘client proofs’, and the password is “dream“. (image numbers for ordering purposes are at the top left corner). At the bottom of this entry you will find the Price list and Order form in PDF format. I tried to make the Order form as user-friendly as possible – you can fill it out on your computer (with Acrobat Reader), and if you click on my email address (see form), it will actually mail your completed form directly to me (I was impressed). I encourage you to pass this around to your friends, tweet, blog, facebook, or good old-fashioned email. Thank you so much for your continued support – it really has been very overwhelming! Here’s to a new decade – may it be full of love, laughter, and fulfilled dreams! Thanks so much for looking.